Vijay Milton isn’t a name that by itself would excite me to watch a film if attached to it, that’s before Goli Soda of course. As a filmmaker he had made just one film in the past, Azhagai Irukkirai Bayama Irukkirathu (2006) and though as a DOP he has been around in the industry for some 15 odd years and done many good films, the only recent film of his that stands out for his contribution is Balaji Sakthivel’s Vazhakku Enn 18/9 (2012). Hence when I first heard that he is back to filmmaking with a film called Goli Soda I wasn’t all that enthused initially to be honest, though the title did appeal to me. But as the release date drew closer I became a little more interested as I realized that the film features the 4 main kids from Pandiraj’s Pasanga (2009) in the lead and that Pandiraj himself has written the dialogues for the film. The promo of the film looked interesting and it was heartening to see popular filmmaker N.Lingusamy present the film and his banner, Thirrupathi Brothers (which he runs along with his brother N.Subash Chandra Bose)picking up the distribution rights. But despite all this I wasn’t completely sold out, at least not till the release date and I really don’t know why. Probably I wasn’t sure if Vijay Milton could pull it off and/or maybe I didn’t feel that the Pasanga gang could feature in a follow up film of sorts which could do justice to their earlier film. But this relatively small film that has been produced by Vijay Milton’s brother Bharath Seeni has managed to actually do that and do it in a completely convincing way. So as they say it’s nice to be surprised like this once in a while especially when you are least expecting it. Koyambedu is one of the most popular localities in Chennai these days. Not only is it home to Chennai Moffusil Bus Terminus (one of the largest bus stands in Asia and providing inter-city & inter-state connections) and the South Asian Federation Games Village (large residential complex originally built for the SAF Games and now utilized by the Government and various Government aided institutions), but also Koyambedu Wholesale Market Complex (KWMC), popularly known as Koyambedu Market, reportedly Asia’s largest wholesale fruits and vegetables market. The Koyambedu market came into existence in 1996 when the market which was previously located in Kothawal Chavadi closed down. This is a market which retailers and individuals flock to for their vegetable and fruit purchases at wholesale prices, irrespective of whether you are buying in bulk or not. The market has a myriad network of shops, suppliers and transporters and people working with each of these segments, people from everywhere. Do we have any idea of the people working over there? Where do they come from, how do they lead their life and what keeps them going? What if we were to look through the lives of people over there? Goli Soda is a film that does exactly that. It is a tale that is centred around people in Koyambedu Market & focuses on Pulli (Kishore), Settu (Sree Raam), Sithappa (Pandi) and Kuttimani (Murugesh), 4 adolescent boys who were orphaned at birth and who now are the best of friends. For them the market is their whole universe and they earn their living as porters in the market. The two elders whom the boys connect to are Manthiravadhi (Imman Annachi), who plies his tricycle in the market and Aachi (Sujtha Sivakumar), a wholesale dealer in the market. Aachi is the one who constantly guides the boys and realizing that they need to do something to go beyond their lowly existence, she takes them to Naidu aka NKB who controls the entire market and seeks his help in securing a loan for them to start a business. Naidu (Madhusudhan) in turn gives them a shop in the market to operate out of and the boys start an eatery over there. The boys are enterprising and soon the business flourishes. But just when everything seems to be going hunky dory in their lives there comes along an incident which creates problems for their very existence and makes their quest for their identity treacherous. How does the boys cope up with the incident and are they successful eventually in establishing their identity in the market is what the rest of the film is all about. At the very outset one can easily feel that the tale is pretty simple, almost like a modern David vs Goliath, with 4 boys instead of one representing David over here. While that is indeed true it’s also important to note that the beauty of the tale lies in its simplicity actually. There is a lot of humour strewn throughout the film and they only help in making the film look more interesting. The roof top portions where the boys try to look at and impress the schoolgirls passing by, Mandharavadhi’s drunken outburst in the Police Station, all the scenes featuring the boys and ATM (Shalini) are a few examples that really are proof of the genuine humour in the film. Goli Soda is also probably one of the most challenging films for Vijay Milton as a cinematographer. While the 2nd half of the film does have a segment with some interesting locations (Kerala, Murudeshwar, Ladakh), the bulk of the film is set in Koyambedu Market and Vijay Milton manages to capture the mood and lighting perfectly. The action scenes are well choreographed and look raw yet realistic. Great care has been taken to ensure that the boys suddenly do not look awkward by being seen doing unrealistic action sequences. It’s also nice to see Powerstar Srinivasan and Sam Anderson feature in small cameos in the film and allow them to be mocked in the film, especially the former. With a run time of around 125 minutes, the film has the ideal pace and length to keep us hooked right till the end. If the first half has us warming to the lives of the 4 boys and getting to know why their need for a proper identity is important, the second half makes us root for them in their fight for survival and justice. Kudos to editor Anthony for ensuring that the film’s editing is a positive aspect as well. S.N.Arunagiri’s songs and Anoop Seelin’s BGM are ideal for a film of this nature and make an impact. The film is well written and Vijay Milton’s screenplay benefits from the dialogues penned by Pandiraj and they carry the requisite punch, humour and depth in them as per the demand of the scenes. The film wouldn’t have worked this well if not for the brilliant characters conceived and the casting choices which have resulted in a perfect fit for these characters. Imman Annachi as Manthiravadhi is hilarious as usual and he is good as an ideal companion for the boys. Sujatha Sivakumar who has been seen mainly in mother roles in various films has probably got the best role of her career so far with Goli Soda and the portion where she is sitting distraught in the staircase of Naidu’s house, when Naidu’s men have gone to confront the boys is very impressive. While both Chandhini and Shalini are good as the romantic interests of Pulli and Sithappa respectively, Shalini in particular is the actual surprise package of the film. She is probably the most believable and interesting character in the entire film. Madhusudhan has been seen in character roles for a long time, but here as Naidu he probably gets a fresh lease of life as not only is the role a powerful one, but it is not a usual one-dimensional role that most villains get to handle these days. That brings us finally to the 4 boys who seem to have progressed wonderfully from their Pasanga days and have left a solid mark here as well with their roles in Goli Soda. 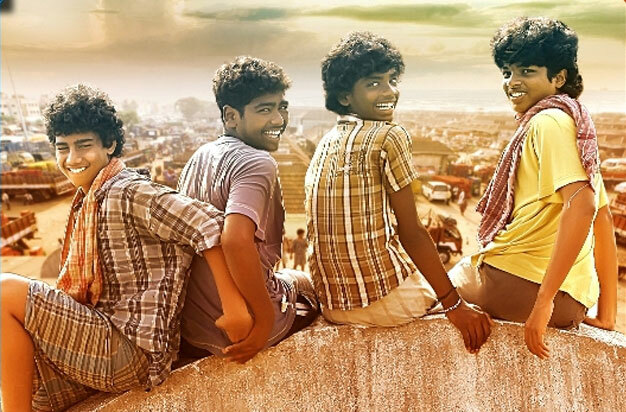 Whatever doubts I had initially of whether these boys could do a good follow up act to Pasanga got shattered even before the 1st half of Goli Soda got over and that speaks volumes of their work. It will be difficult to single out anyone among them for their work for all of them complement each other quite well, making it a good team effort. Goli Soda is a honest tale that was waiting to be told and it is to Vijay Milton’s fortune that he managed to bring it out before us. We are still only in the 1st quarter of the year and there’s a long way to go yet, but my gut feel says that Goli Soda will eventually turn out to be one of the best Tamil films of the year. Go watch this tale of the dashing and daring Koyambedu boys, I’m sure you won’t be disappointed. Ram Leela Movie Review: Kya Goli Khila Rahe Ho! Good watch with a nice cast….